ORS uses acoustic wave therapy is widely used in the treatment of acute and chronic pain in muscles, tendons, and joints. The Piezowave uses acoustic waves to target tissue at varying depths to compress and manipulate tissue resulting in a focused and precise deep tissue massage. The results of the mechanical stimulus delivered by the WellWave machine can lead to increased circulation and pain relief-key components in the healing process. The acoustic waves generated by the WellWave machine painlessly pass through the body and converge at a point deep within the soft tissue to produce intense, extremely short duration compression event. The focused acoustic compression is translated to tissue to provide a massage with pin-point accuracy to the affected area. 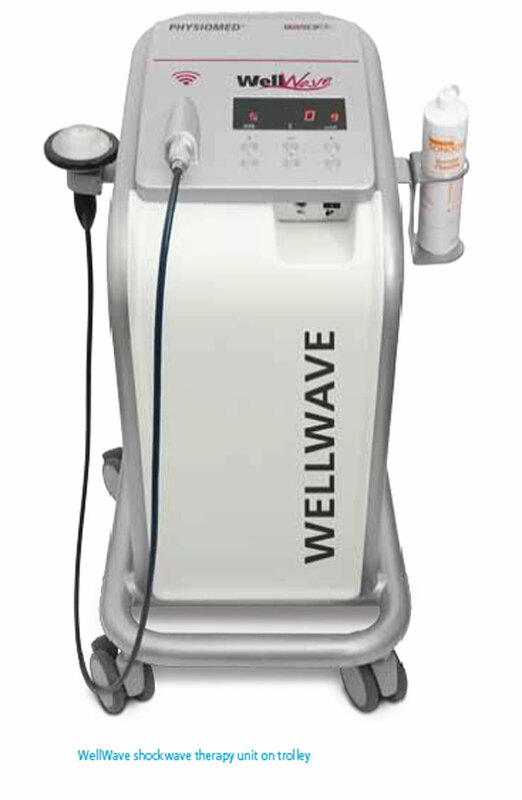 A typical WellWave treatment takes between 10 and 20 minutes. Normally, 1-2 treatments per week are performed with a total of three to five treatments may be necessary before lasting improvement is achieved. With acute pain, a single session is often successful. Your therapist will identify the treatment site or sites. They may mark these sites. They will then apply a thin coat of coupling gel. This gel helps to translate the acoustic sound waves generated by the therapy head to the body. The therapist will start the treatment at a very low output setting and increase the power to a level that you help define and is best suited for your condition. The output level and acoustic wave frequency rate may vary from location to location based on the depth and type of tissue being treated. As the therapist moves the therapy source around the treatment area, you may feel a deep, dull ache that is familiar to you as being like the feeling your condition produces. The therapist will ask you to report when you feel the ache and will adjust the output of the device to the appropriate level for your treatment. They may also ask you to confirm that the therapy source is still creating the ache and may adjust the location of the treatment based on your feedback. If at anytime the treatment becomes uncomfortable, mention this to the therapist and they will adjust the output level. After the treatment is completed, the coupling gel will be removed and you can return to your normal activities. You may experience some minor aches or discomfort after treatment. It is not unusual for patients to notice flushed or reddened skin around the treatment site. WellWave (ACT) Therapy: performed at ORS West Clinic, Total Joint & Aquatic Center and Holt Clinic. ORS has several therapists trained in the treatment and it is offered at the West Clinic , Holt Clinic and the Total Joint and Aquatic Center.